Jim Farley, left, Ford's group vice president of global marketing, sales and service, greets Beau Smith of Sill-TerHar Motors in Broomfield, Colo., before the Lincoln make meeting. • Dealers must meet new requirements to keep Lincoln franchise. • More than 100 more Lincoln stores will be cut from top 130 markets. • Dealers will be compensated $50 to $75 on deliveries of tech-heavy vehicles. SAN FRANCISCO -- After months of waiting, Lincoln's 1,100 dealers finally learned what they must do to keep their franchises. Some smaller dealers say it will be a stretch. -- Offering such services as a free car wash and loaner vehicle to service customers, said Christian Bokich, a Lincoln spokesman. -- Having a dedicated Lincoln service manager and sales staff at stores that sell Ford and Lincoln. -- Having signs that say only Lincoln. Mercury disappeared as a brand on Dec. 31. -- Offering a used-vehicle inventory that includes at least 30 percent certified-used vehicles. Ford expects Lincoln dealers to meet those requirements, part of a plan to rebuild the Lincoln brand, by Oct. 1. If they do not meet those criteria, they will see their vehicle profit margins erode relative to other Lincoln dealers' margins. Those who don't want to or can't meet those and other demands, which Lincoln will outline later, will have to consider turning their franchises back over to the automaker. "We believe everything we're laying out is more than reasonable compared to our competitors," Bokich said. Jack Kain, of Jack Kain Ford Inc., in Versailles, Ky., said: "The bigger stores can do it, but it's going to be hard for smaller dealers to do." Lincoln dealers will also get $50 compensation for the extra time it takes to deliver a vehicle equipped with Sync and $75 for a vehicle equipped with Sync and MyLincoln Touch. Sync is Ford's voice-activated technology that allows a driver to pair a Bluetooth phone to it. MyLincoln Touch is voice-activated and touch-screen technology that controls climate, entertainment, phone and navigation. Ford's goal is to have 325 Lincoln stores in its top 130 markets, down from 434 stores now, said Ken Czubay, Ford's vice president of U.S. sales and marketing. 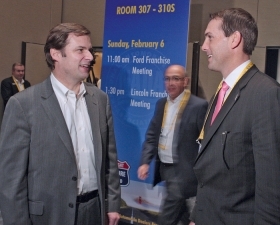 Jim Farley, Ford's group vice president of global marketing, sales and service, spoke to dealers at the make meeting. Afterward, he told reporters that while Ford did not show any products it plans for Lincoln in the next four years, the dealers do know the product cycle and "when each product is launching."